Peace to me means being able NOT to get my emotions to work before my brain can think something through. Peace is important to my every day living. Peace brings about discussion, interaction and problem solving without tears. Peace is only possible with the Lord’s guidance (at least for me). My acronym for PEACE came to me when I first started to study the Bible and learn about God. I realized I didn’t have to get myself upset all the time over everything. As a matter of fact I could work through even the toughest assignments with God’s help. But I had to learn to surrender control. PUT EVERYTHING ASIDE – CHRIST ENTERS. That spells P E A C E.
If you can do that all the time – you will have peace no matter what. 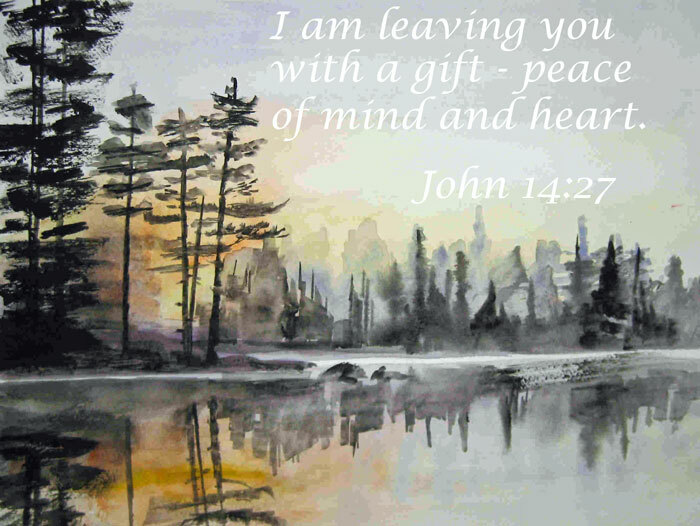 Hope you are all filled with the peace of Christ. This entry was posted in Prayer and tagged Acronym, Advent, Jesus, peace on January 10, 2013 by JanisCox. Thank you Marijo, I am a work in progress just like my watercolour. Trying to listen to God in all situations. We can give it all our best shot – HE will carry us when the going is really tough… last year at this time I was undergoing radiation for breast cancer – the Lord allowed my first book to be published to give me another focus through it all… WOW HE always has good plans! I am so thankful to God for caring you through that trial – with peace in your heart. And yes isn’t it great to have something to focus on when we are going through bad times. Starting with the water color at the top – this exudes peace and a definite challenge…. I am so glad I signed up for your updates! THANK YOU LORD! Do You Have Dusty Knees? Sunday Stillness - What can we learn from the Rock Badger?